Recently, the waters of the CSR community have been stirred by the ideas put forth by University of Michigan Professor Aneel Karnani in his Wall Street Journal piece, The Case Against Corporate Social Responsibility. Professor Karnani argues that "while companies sometimes can do well by doing good, more often they can’t because in most cases, doing what’s best for society means sacrificing profits." The debate has gone viral on blogs around the world, and Karnani’s piece has been credited with positing key questions about the corporate world’s theoretical responsibility and actual influence in creating global social justice. What are the respective roles of the public and private sector in creating meaningful reform of the corporate world? 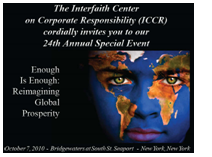 The debate goes live on October 7th at the Interfaith Center on Corporate Responsibility’s Special Event when speakers from the disciplines of business/CSR, faith and policy will offer their interpretations of the theme, Enough is Enough: Reimagining Global Prosperity. For the past two decades, the ICCR annual event has brought together over 300 leaders from the CSR community in a growing coalition of investors, asset managers, corporations allies and social justice advocates. Join us as our distinguished panel, including Professor Karnani, share their visions for a more just and sustainable world and discuss the future of the corporate social responsibility movement. The event will also feature Rinaldo Brutoco, Founder and President of the World Business Academy, a nonprofit business think tank with the mission to inspire and help business assume responsibility for the whole of society, and Rabbi Rachel Kahn Troster, Director of Education and Outreach for Rabbis for North America, where she coordinates campaigns against human trafficking. This insightful and provocative conversation will be moderated by Darren Gersh, Washington Bureau Chief for PBS’ Nightly Business Report. Some tickets are still available so be sure to make your reservations now. Editor's Note: If you missed Fenton Group's recent debate featuring Professor Karnani, this event is a must-attend, not only because you'll get to hear from the man of the hour himself, but also to understand why the business community remains divided on the scope of corporate responsibility. Ruhi Shamim is a social media marketer and blogger, specializing in corporate social responsibility, urban planning and sustainable transportation, and cultural diplomacy. She has worked with Sosauce, Justmeans, Sparkseed, and the Interfaith Center on Corporate Responsibility, and is currently developing a Green Network for JobThread, a New York based technology startup.